On May 9th 2015, the World Health Organization declared Liberia the first of the “big three” African countries to be Ebola-free, ending for Liberia an epidemic which has swept across West Africa and claimed the lives of over 11,000 people. Guinea and Sierra Leone, the other two countries most affected by Ebola, continue to report new cases and battle the virus, but already, a group of rising high school seniors from New York City are making their way to Liberia to jumpstart the Liberian education system which had once again received a heavy blow from the epidemic during its gradual recovery from the effects of the Liberian civil war. This group of four high school students, Alison Zhao, Michelle Chan, Amy Pan, and Edward Zhou, attend New York City’s prestigious Hunter College High School and are members of the I-HELP Liberia Project, a US-based organization founded in 1994 that aims to improve math and science education in Liberia. Founded by students, the organization’s efforts to aid Liberian education have occurred both overseas and domestically, as several trips to Liberia have been made in the past in addition to numerous fundraising events within the city, such as benefit concerts and shoe drives. I-HELP has sent aid to several Liberian schools, such as the Booker Washington Institute, through the shipment of educational materials including laboratory equipment, computers, and textbooks. I-HELP has also run math and science workshops hosted by Hunter students in Liberia. I-HELP Liberia also plays an active role in the activities of the Liberian community in New York, the Liberian Mandingo Association of New York, and the Nimba County Association of New York. The I-HELP Liberia Project is also sensitive to changes in the Liberian community: in light of the recent Ebola outbreak, I-HELP hosted a benefit concert dedicated to the theme of using science education to spread awareness about Ebola, which included a stimulating forum discussion led by experts in public health and immunology. In addition, the I-HELP Project at Hunter held a drive for health and sanitary supplies to ship to Liberian hospitals. The I-HELP Liberia organization has members from across the country, comprised of many graduates of Hunter College High School from the last two decades. These graduates hold a range of leadership positions at American universities, hospitals, and major corporations. Liberian education has frequently received the short end of the stick for the past thirty years, as the country was ravaged first by two civil wars which resulted in the deaths of hundreds of thousands and most recently has been the victim of the deadliest Ebola outbreak in history. Throughout the civil war, chances for education were scarce and schools were scoured for science equipment, leaving educational facilities in a dearth of materials to work with. In July 2014, the education system that had slowly been recovering was once again halted as schools were formally closed at the outbreak of the devastating Ebola virus, with no plans of continuing education. Now, with schools back in session, these four students, inspired by Mr. Randolph, a Liberian himself, are determined to get the Liberian school system back on its feet. This summer, they will be travelling to Liberia on a trip that had been in the works since last year but had to be postponed due to the Ebola outbreak. They will be working with Liberia’s Ministry of Education to hold workshops and teach lessons throughout the country, including educational sessions on the Ebola virus and its prevention. 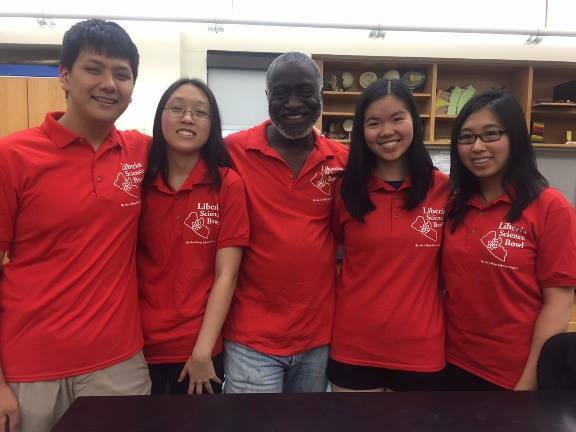 They will also be hosting a Science Bowl tournament, a popular extracurricular activity among high school students in the United States and which they partake in at Hunter, to foster interest and dedication to science education in Liberian students. Michelle, Amy, Alison, and Edward will leave in Liberia laptops and laboratory equipment to provide resources for Liberian teachers to continue our efforts of taking science education in Liberia to higher levels. I will love to appreciate Mr. Ansumana Jabateh Randolph and the I-help Liberia Project for their meaningful contributions to the educational system strengthening in Liberia, especially at the time when Liberia is faced with many crisis in the educational sector, especially in the area of science and math education. I-help Liberia has been a major contributor in working with the Liberia Ministry of Education. They facilitated the training of the first national science and math teacher training workshop since the civil crisis in Liberia. This workshop was conducted for the first 100 science and math teachers across the country. It was a ten days intensive training workshop in specific code subject areas (biology, chemistry, physics and math) which were extensively treated with emphasis on hands-on activities. Teachers were highly fascinated to the training and wish to have such capacity building training every year to empower them for the year’s obligation as teachers. As commitment to the service of strengthening science education in Liberia, I-help Liberia team was also able to sponsor and launch the first Liberia Math Olympics among ten schools in Liberia in 2014 June 4. Also in June 27-30, was able to sponsor and launch the first Liberia Science Bowl Competition among 30 high schools across the country in Liberia which has created a sort of inspiration and motivation among high schools in Liberia. They were also able to distribute buzzer systems to participating school to facilitate training activities among students for better and more competitive competition in the future. Liberian must be grateful to Mr. Ansumana Jabateh Randolph and the I-help Liberia project for their enormous contributions they have and continue to provide for the system. If we can have about 5 of Mr. Randolph who will have the heart to make an impart in Liberia especially in Science and Math education system strengthening, I believe we can make greater impart in the soonest possible future. Again Mr. Randolph and the I-help Liberia team, my heartfelt thanks appreciation to you. Look forward for more collaboration for science and math education system strengthening. Thank you for your kind words! We are looking forward to our continued collaboration and hope to be able to continue to make a difference. This is great! We have something in common – making a difference in Education in Liberia. I just started a partnership with the Liberian Girls Guide Association to distribute reading and text books to schools in Liberia. We are preparing two 40′ sea container of books to ship to Liberia this Fall. I am going to share what you doing in Liberia with a high school organization in Westerville School District in Ohio. work.kindly permit me to introduce mr Amadou the cordinator of the said organization.and hope you will appreciate our approach. finally,could you accept our invitation of coming to guinea,conakry. We are currently only conducting operations within Liberia, and unfortunately have no plans to move into Guinea in the near future. However, we would be very happy to have a discussion so that both of our organizations can learn from each other. Ok cool,I just figured out that you had a blog link.No field rpreot! !Well at least you get a Liberian flag tucked under your pillow.BTW,they speak English as main language over there,right? That’s correct! English is Liberia’s main language. My name is Allen. I am a Liberian-American. I’ve been out of Liberia since the early 90s. I am highly interested in your I-Help Liberia program and I’m hoping to get more information. I am an electrical engineer with specialty in power systems. I want to help the people and looking to volunteer. Please advise. We’re thrilled to hear that you want to help. Please come back to our website soon for more information as we continue to update it, and look to receive a message from us soon so that we can have a more detailed discussion.